Hey all, feeling a little out of breath today hence for not posting a new one in the afternoon like I usually do. I always prepare my draft for my next day blog post for this page at night, but I "launched" (lol) my blog shop officially last night so it got pretty crazy. 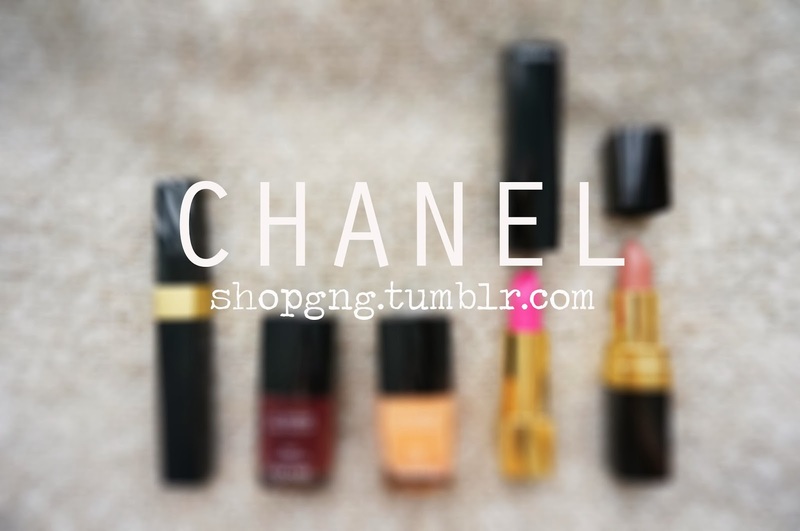 Oh by the way, I got a bunch of Chanel's and Maybelline's up on my blog shop so head on over to check it out if you want. I'm trying my best to post up as many products as I can, so you girls can shop over the long weekend and I can deliver most orders during the coming weekdays; but the thing is I can only shoot in the morning until afternoon because I don't have studio lighting in my house and I need to borrow the natural sunlight, and I'll be spending rest of the day editing the pictures, then post them up on both tumblr and Instagram D: Maybe I should start hiring, haha just kidding, or maybe not. Well anyway, my eyes are getting real tired right now because I've been facing my laptop, phone, camera and iPad screen for the whole day, so I'm just gonna wrap things up real quick. On my finger I'm wearing the Tiffany Olive Leaf Ring and on my nails I'm wearing Chanel Le Vernis Nail Colour in 537 Riviera (hot pink) in the picture above. Base coat is Sally Hansen's Miracle Cure, top coat is Sally Hansen's Dries Instantly Top Coat, both available in Watson and Sasa I suppose [not an ad]. I am selling 2 Chanel nail colours on Shop Guns&Glitters, not this colour though. 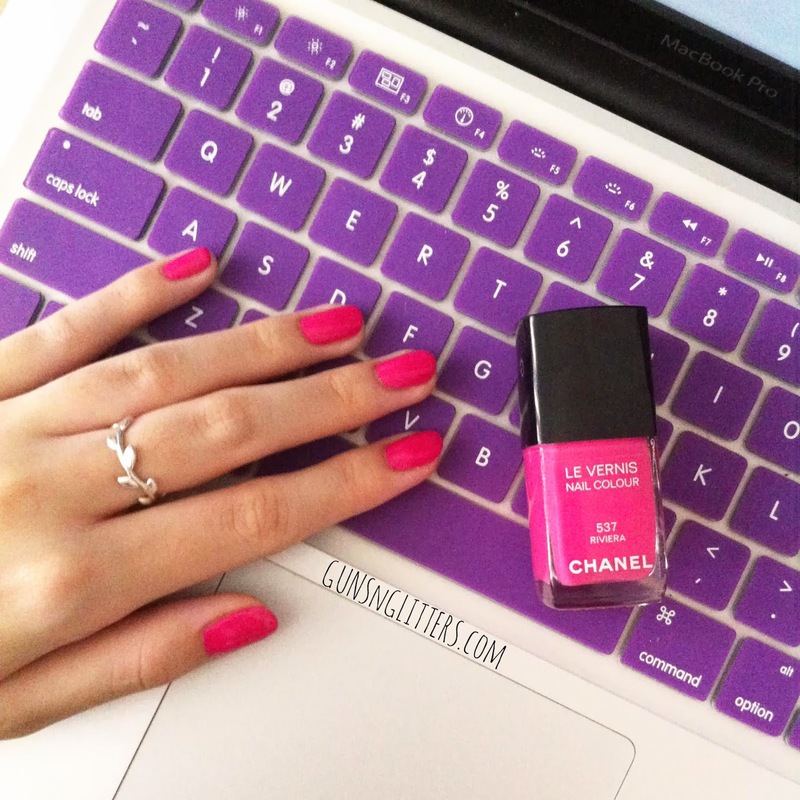 Chanel polishes are generally very good in quality (duh right? you're paying RM70 for it, but if I may self-advertise, Shop Guns&Glitters is selling for only RM35), the brush is very thin and small so it's easier for you to reach those hard-to-reach areas, allowing better precision that is; and it lasts very long, around 2 weeks for me when I wear it with the Sally Hansen Dries Instantly Top Coat. Purple MacBook keyboard cover is from HausofBiB, just in case you wanna know. That's it! I'll talk to you tomorrow then, happy holidays!